Sick of the two yet? 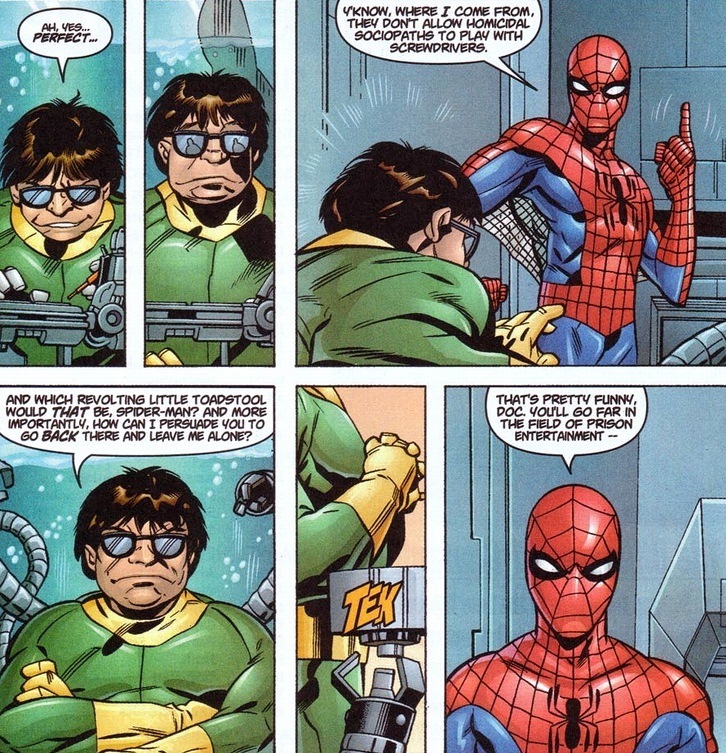 Last day of Spider-Man and one more day of Doc Ock, I promise. For at least a week or two. Finally we get to witness the supervillain in both his classic outfit and haircut. I’m excited too. 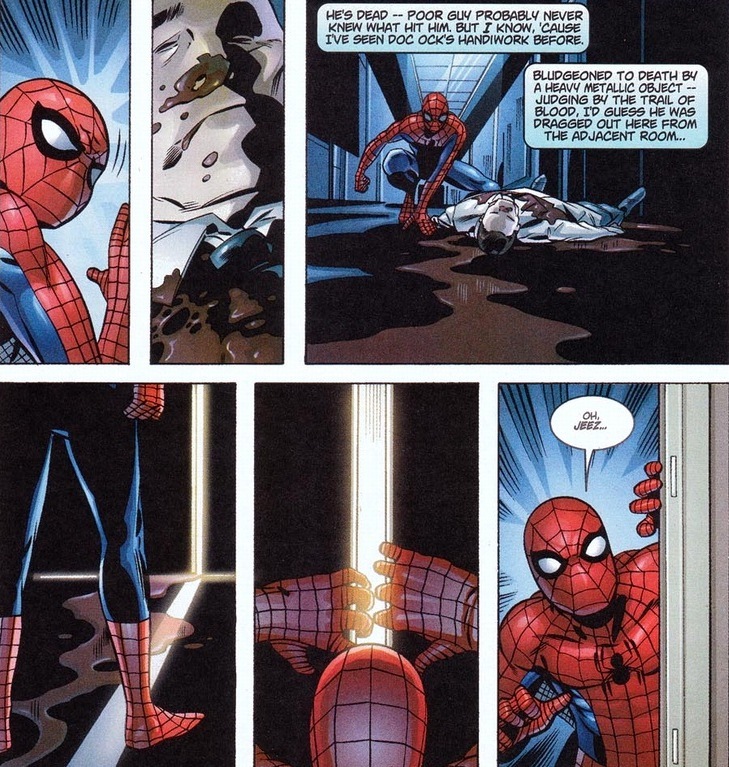 Let’s delve right into Peter Parker: Spider-Man #39-41, written by Paul Jenkins and drawn by Mark Buckingham. 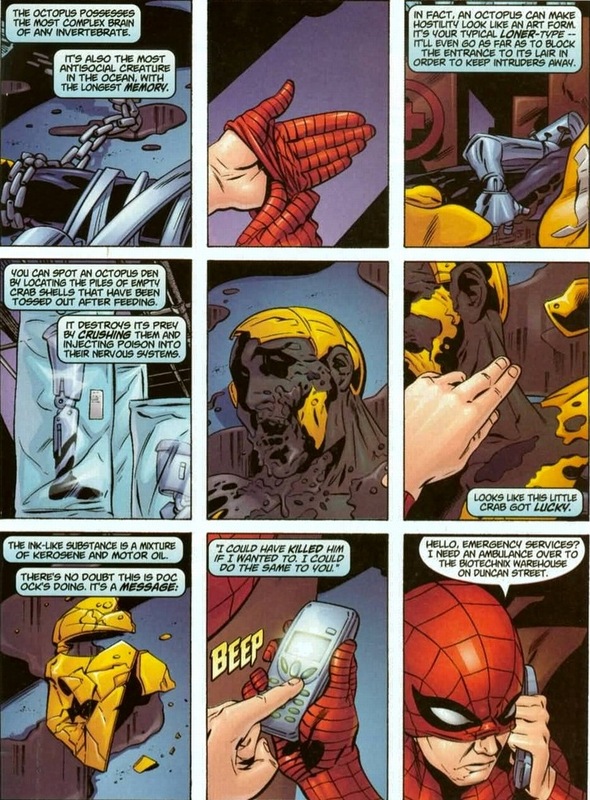 So the story’s actually about a prosthetic limb conspiracy, which is a super awesome concept. Unfortunately, we’re going to ignore almost all that part. How the doctor’s fallen from grace. 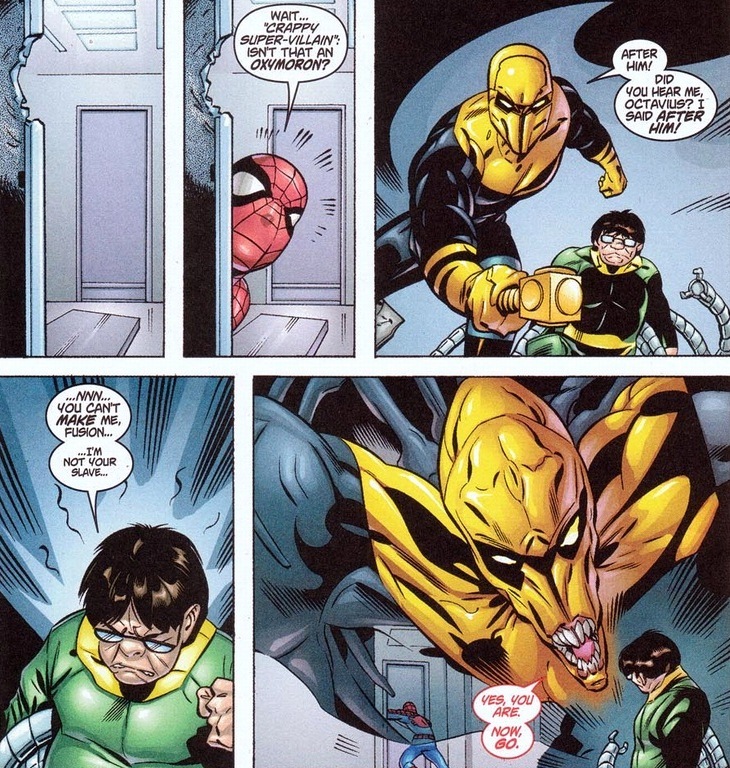 Fusion, who’s a very minor bad guy, has the mutant power to persuade others to do and think what he wants and manipulate senses. Also, more complicated stuff, but that’s the gist of it. 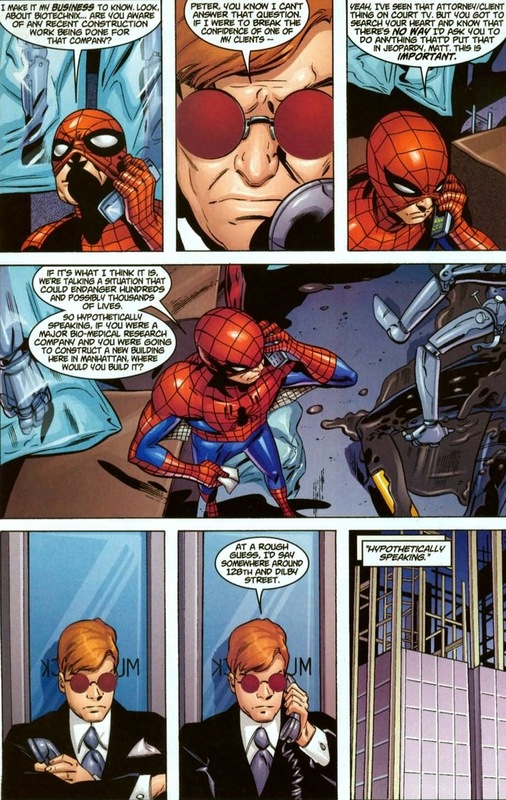 Eventually, Spider-Man shows up, because y’know, his name’s in the title of the series. 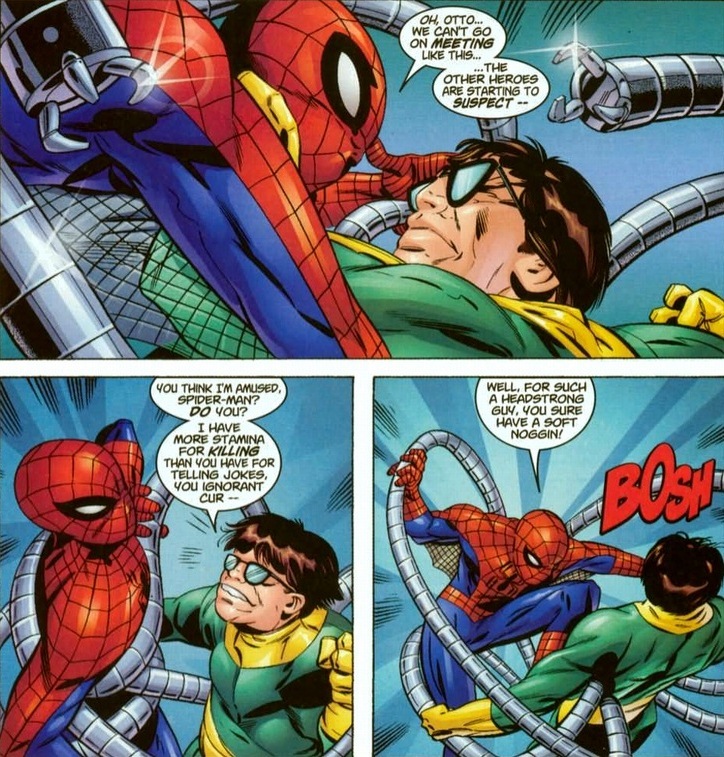 By the way, “the supervillain who fights like a computer nerd” may simultaneously be both the most hurtful and accurate description of Doctor Octopus I’ve ever read. 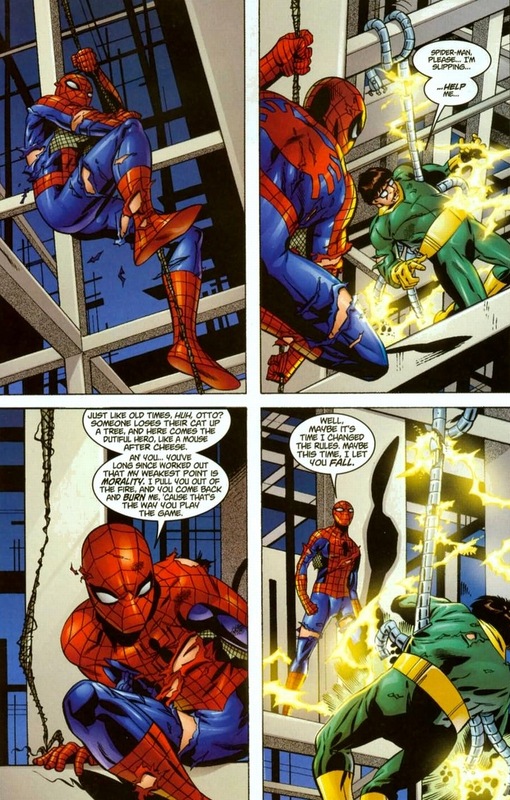 Unfortunately for Spider-Man, he didn’t catch on to the whole team-up thing going on and in a fight I’m not showing you, he gets a surprise beating. See? 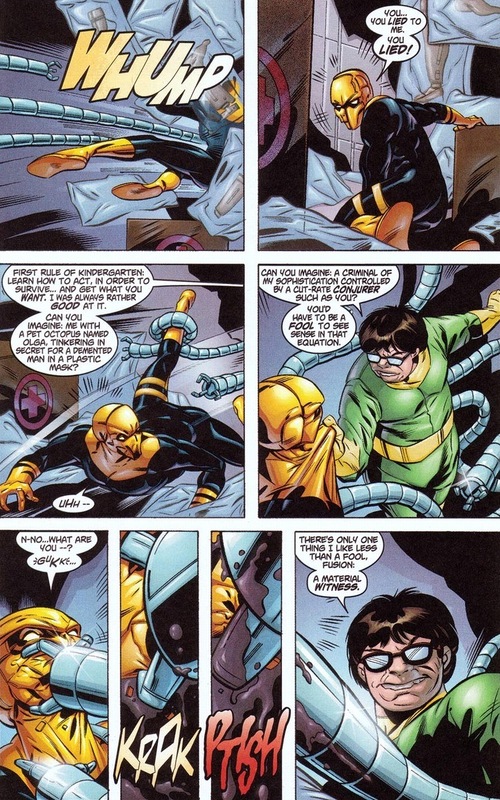 Count another case of massive head trauma for Doc Ock. 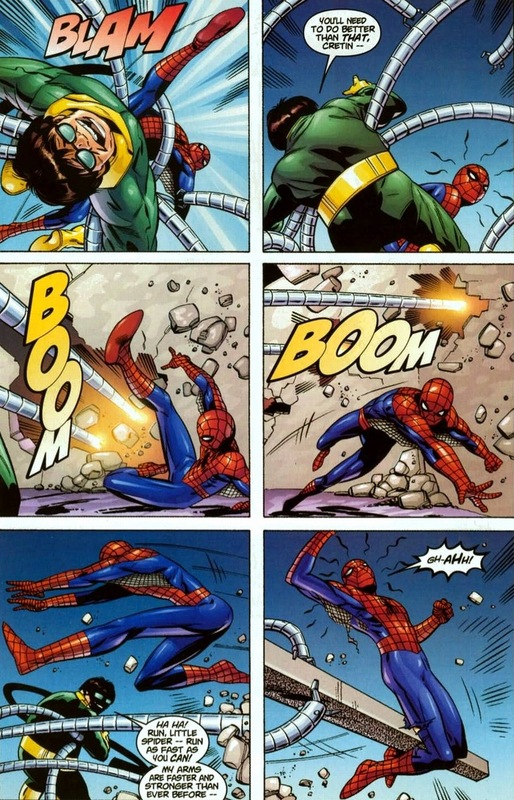 The proportionate strength of a spider applies to all of Spider-Man’s body parts. And just so you can appreciate what’s coming up, here’s an example of Fusion’s powers. Scary stuff, I’m sure. 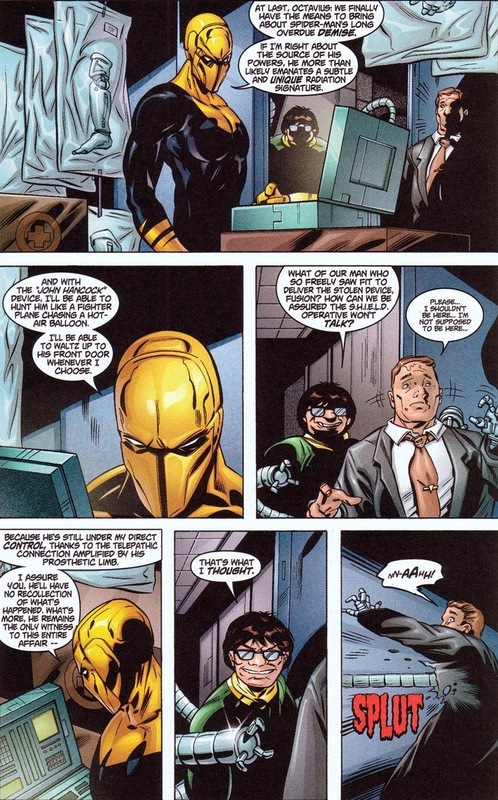 So this is Fusion’s last appearance in the comic book world. You’ll understand in a second. 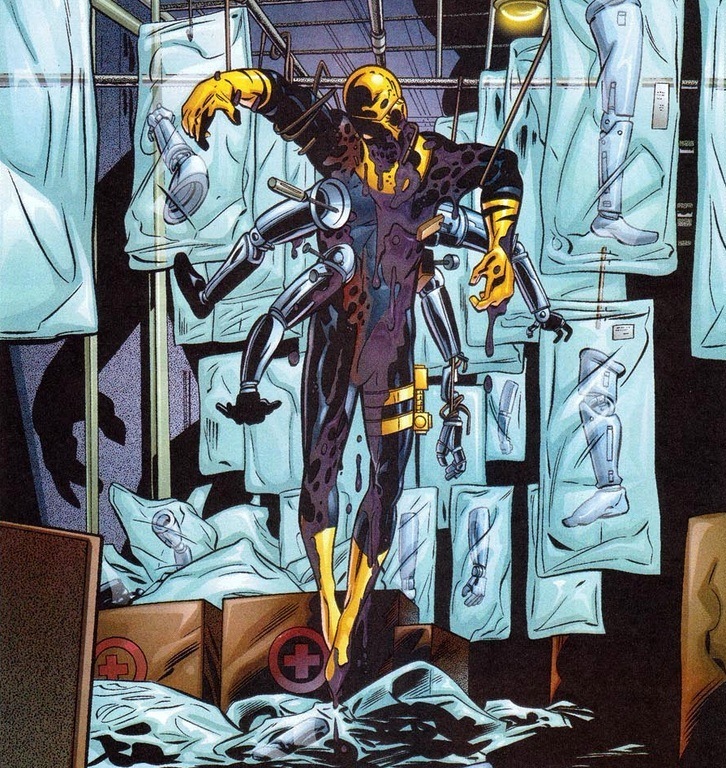 Just understand that Octavius’ flair for the dramatics makes him far more formidable than both you and Fusion think. Wonderful show by the doctor. 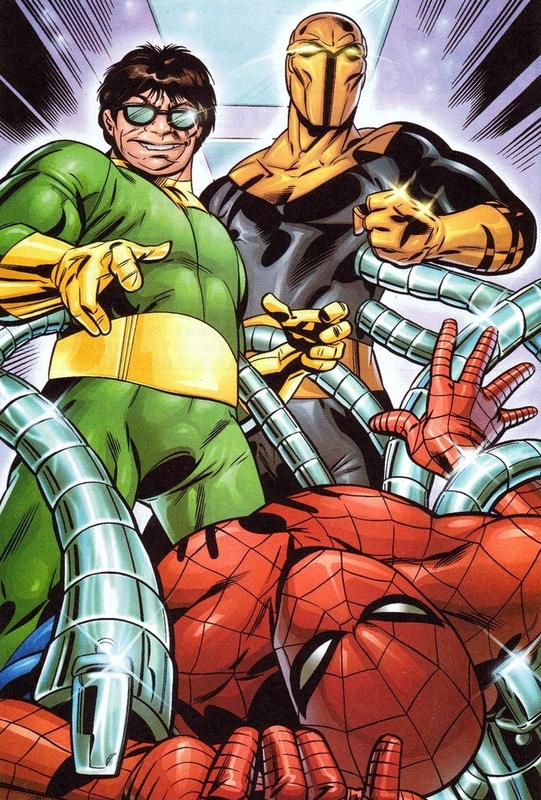 The dude’s the second (or third if you want to argue Venom) most infamous Spider-Man villain for a reason, and Spider-Man has the largest rogue gallery in comics. Well, probably after Batman. Want to see the aftermath? Obviously this is a lead up to a climactic battle between the two bitter enemies. 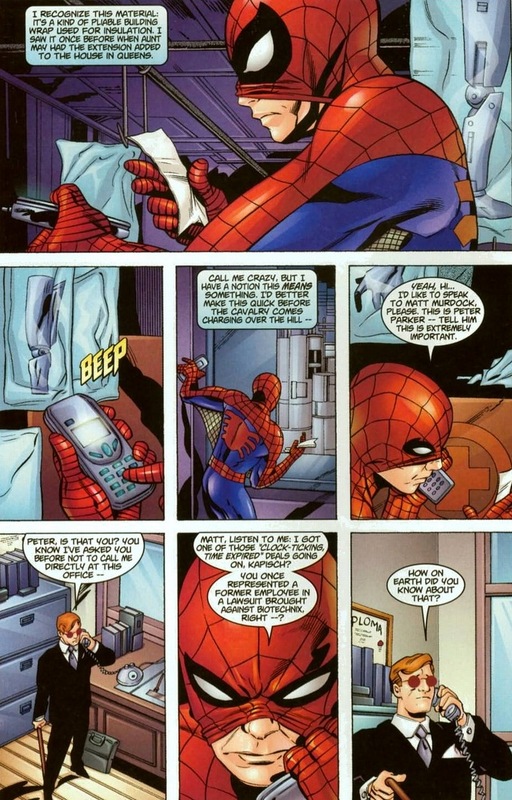 But I would like to showcase one aspect of Peter Parker’s personality that’s rarely praised — his detective skills. The guy’s not exactly Nick Fury, but let’s give our hero his due. Or at least his superfriends. In case you don’t know Murdock, that’s lawyer/vigilante Daredevil. Giving a good name to gingers everywhere. Let’s skip to the fight. If you don’t feel like using a dictionary, vacuous is a synonym for stupid. I just looked it up. 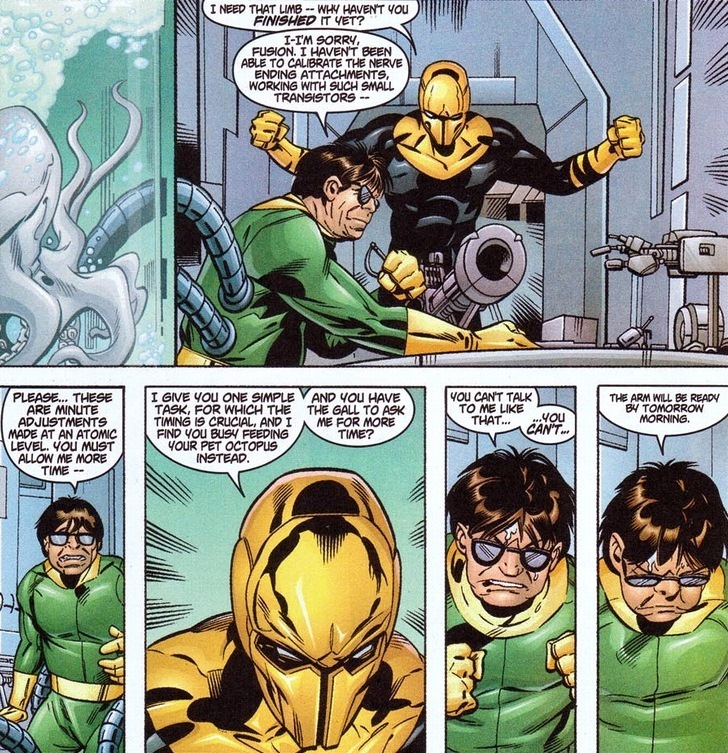 You’re on your own for Doc Ock’s other SAT words he’s used so far. 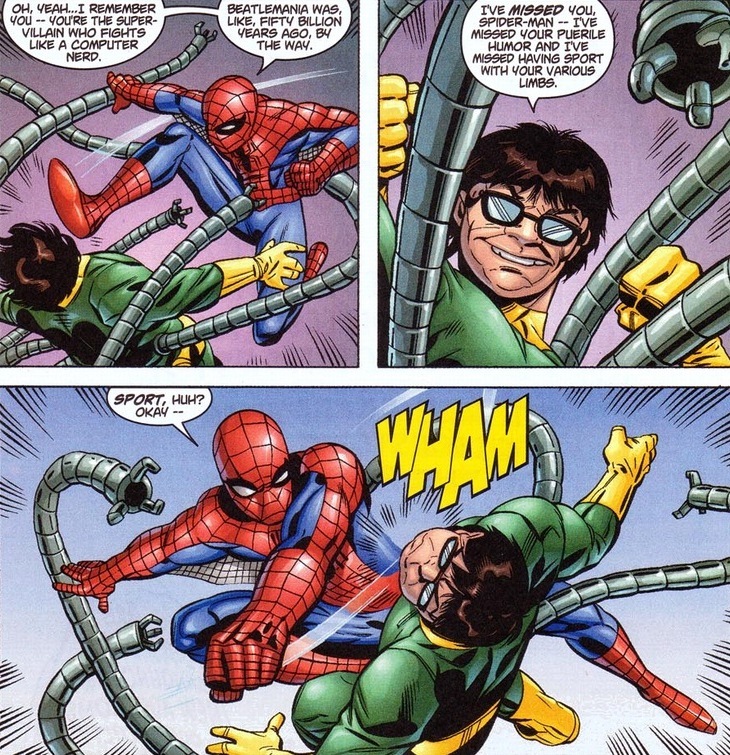 You know why Doctor Octopus always loses? Well, besides being the bad guy? Ego. 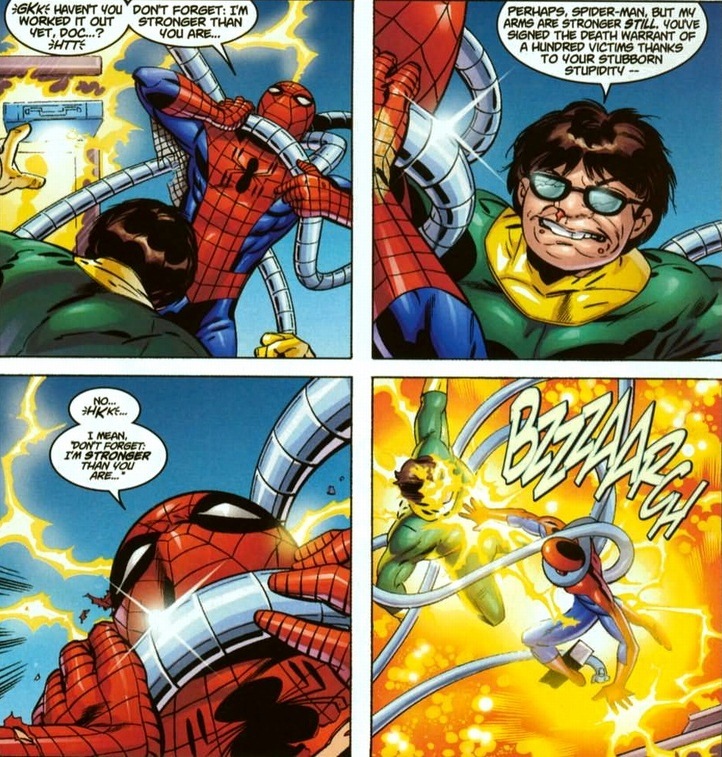 To beat his supervillain, Spider-Man shoots the electricity through his own body to electrocute Octavius. 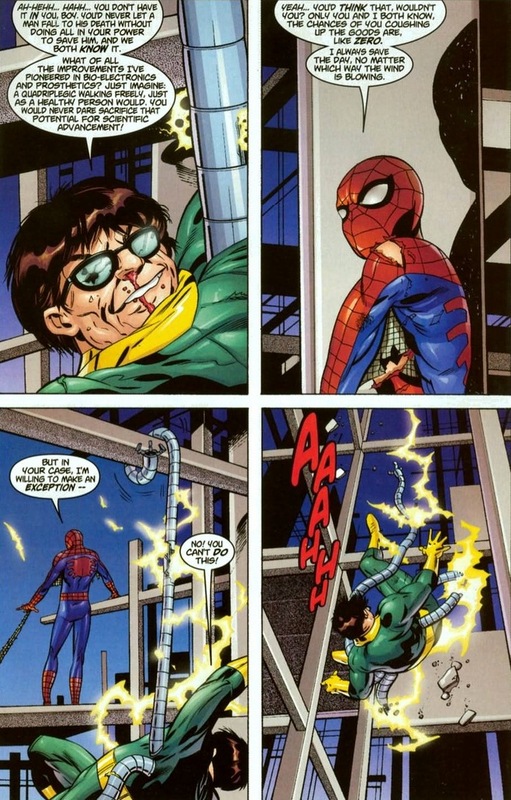 And because of his enhanced spider-durability, he can take a lot more voltage than the poor doctor. To be fair, Octavius should have spent more time killing and less time gloating. 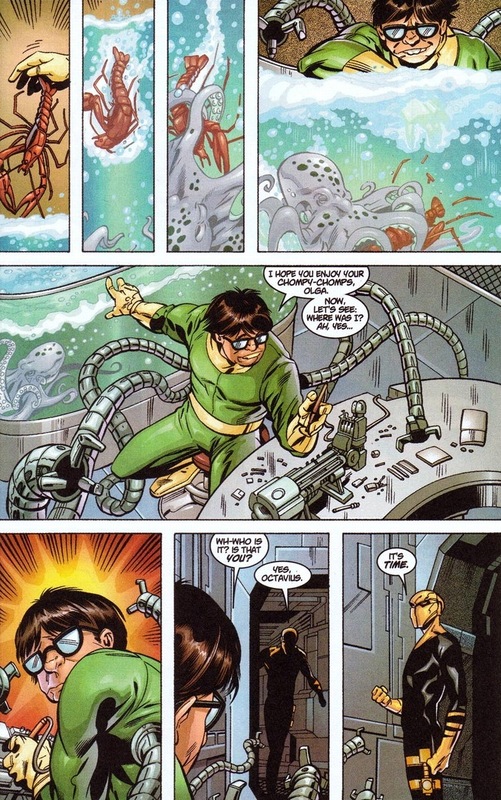 Doctor Octopus: the intelligence of a computer nerd, but the combat instincts of one too. 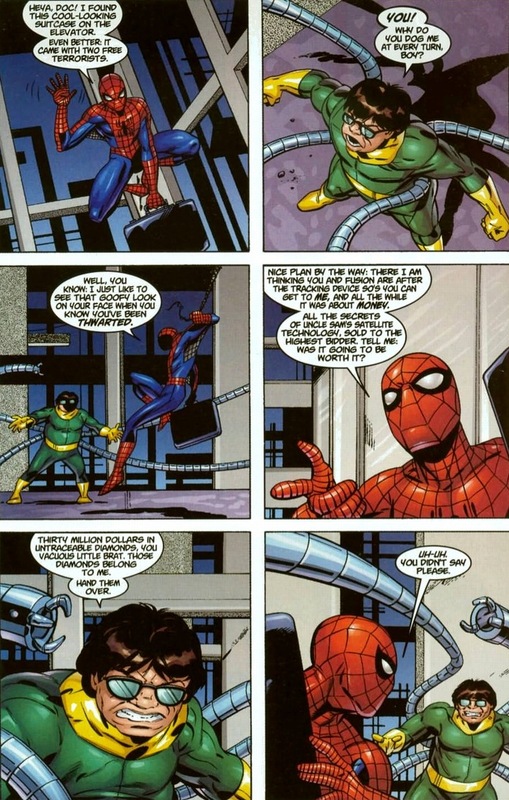 And so Doctor Octopus lives to fight another day. 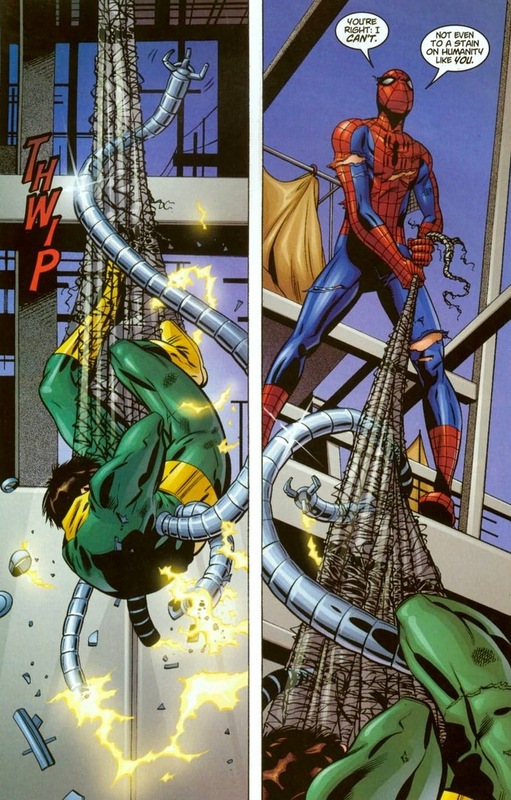 I don’t think he realizes how lucky he is to be Spider-Man’s enemy. I’m just saying the Punisher would have watched him become a green and metallic stain on the pavement. Gleefully. 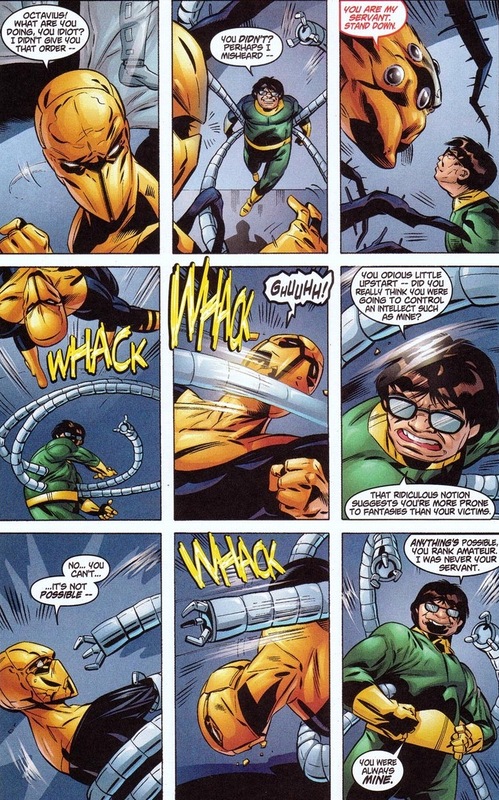 On Friday, Doc Ock battles Iron Man! Do you enjoy reading bitterness and resentment? Oh, I certainly hope so.